“Toil and Trouble” – United States Secretary of Defense Wynn Crawford (Mitch Pileggi) shuts down Gibbs’ murder investigation and demands that Special Agents McGee and Torres be arrested for their actions in the case, on NCIS, Tuesday, Jan. 8 (8:00-9:00 PM, ET/PT) on the CBS Television Network. “What Child Is This?” – The team’s holiday plans are put on hold when the murder investigation of a Navy veteran includes the discovery of a newborn baby who has no identification and no apparent ties to a family, on NCIS, Tuesday, Dec. 11 (8:00-9:00 PM, ET/PT) on the CBS Television Network. “A Thousand Words” – After a mural by a street artist and activist is stolen, the NCIS investigation leads to a conspiracy regarding a Navy contractor and the safety of ocean mammals. Also, Bishop shares a special connection with the street artist, Tuesday, Nov. 13 (8:00-9:00 PM, ET/PT) on the CBS Television Network. “Beneath the Surface” – After NCIS arrives at a Halloween crime scene, Torres recognizes the victim as a former friend from federal law enforcement training. Also, Jimmy thinks his lab is haunted by ghosts when objects keep mysteriously moving, on NCIS, Tuesday, Oct. 30 (8:00-9:00 PM, ET/PT) on the CBS Television Network. NCIS series regular Rocky Carroll directed the episode. 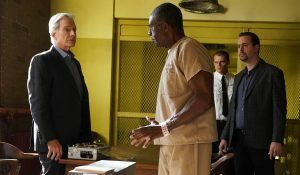 “Fragments” – After a 50-year-old tape recording left by a murder victim is found, the NCIS team tries to exonerate Ray Jennings (Charlie Robinson), the Marine serving a life sentence for the crime, on NCIS, Tuesday, Oct. 23 (8:00-9:00 PM, ET/PT) on the CBS Television Network. “Third Wheel” – Gibbs’ quiet vacation at his remote cabin is interrupted by a surprise visit from Tobias Fornell (Joe Spano) and Navy Captain Phillip Brooks (Don Lake), as well as a call from NCIS asking for his help locating a robber hiding in the woods near him, on NCIS, Tuesday, Oct. 16 (8:00-9:00 PM, ET/PT) on the CBS Television Network. “Boom” – One of the NCIS agents is starstruck after the team investigates an explosion outside the home of Navy Petty Officer First Class Todd Nicholas (Cameron Radice) and his wife, popular reality TV star Sheba Nicholas (Tara Holt). 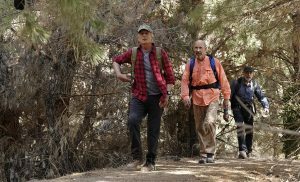 Also, Vance continues physical therapy for the injuries sustained when he was held hostage, on NCIS, Tuesday, Oct. 9 (8:00-9:00 PM, ET/PT) on the CBS Television Network.